Executive Roundtable: Leadership, Trust, and Skills in Overcoming Obstacles to Radical Innovation in Healthcare. 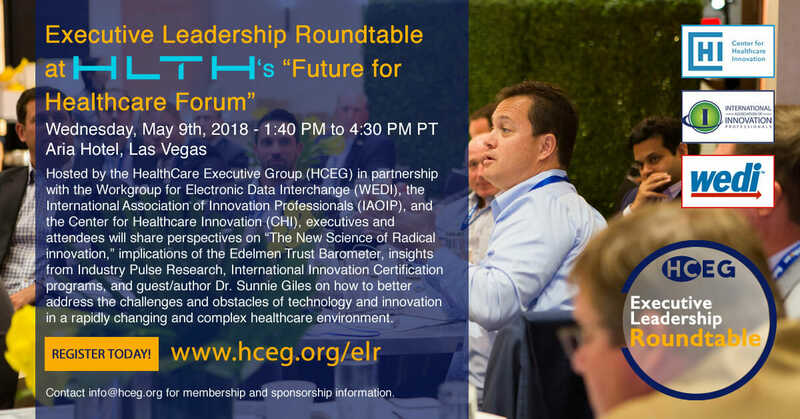 Hosted by the HealthCare Executive Group (HCEG) in partnership with the Workgroup for Electronic Data Interchange (WEDI), the International Association of Innovation Professionals (IAOIP), and the Center for Healthcare Innovation (CHI), executives and HLTH.co attendees will share perspectives on “The New Science of Radical innovation,” implications of the Edelmen Trust Barometer, insights from Industry Pulse Research, International Innovation Certification programs, and guest/author Dr. Sunnie Giles on how to better address the challenges and obstacles of technology and innovation in a rapidly changing and complex healthcare environment. Note, you must already be a registered attendee of HLTH 2018 to attend this event at the Aria.